This gacha contains the same pool of characters and mobs as Gacha:Co-op at higher rates for rares. Exact drop rates are unavailable. One pull consumes ten times as much Ally Point as the regular Co-op gacha; a single roll consumes 2000 points, while a multi-roll of ten consumes 20000 points. This gacha focuses on better items such as ☆3 and ☆4 (Boost of each attribute, ☆3 and ☆4 Souls of each weapon, and rare mobs that are also available at lower rates in the Co-op gacha. 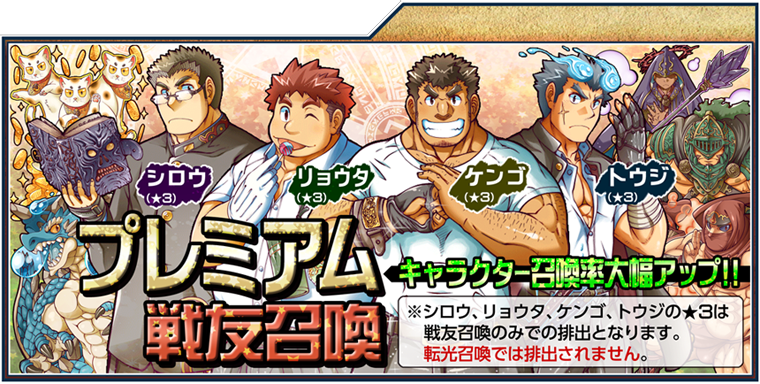 Mobs from the regular co-op gacha are also available in this gacha; you are not guaranteed any of the rarest mobs, but you have better odds to pull them. Additionally, ☆3 characters from the Main Quest can also be obtained through this gacha. ↑ 1.0 1.1 1.2 1.3 <Very low chance to get. ↑ 2.00 2.01 2.02 2.03 2.04 2.05 2.06 2.07 2.08 2.09 2.10 2.11 Low chance to get. This page was last edited on 15 July 2018, at 00:04.